TORRANCE — A unique Japanese music and dance program, “The Art of Shamisen – The Three-Stringed Lute,” will be presented at the James Armstrong Theatre in Torrance on Saturday, Sept. 29, at 2 p.m. 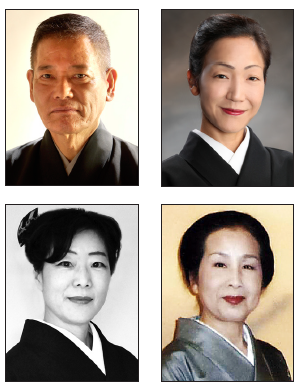 The Nihon Buyo Kai of California, a nonprofit organization whose mission is to promote, preserve and present Japanese traditional dance and the arts associated with it, has invited Honjoh Hidetaro, headmaster of the Honjoh School of Shamisen in Tokyo, to lead an ensemble of four shamisen, a flute/shakuhachi and three percussion artists from Japan. He will be joined by shamisen players Honjoh Hidegoro, Honjoh Hidejiro and Honjoh Hideeiji; and hayashi (percussion and flute) performers Tousha Chiho, Mochizuki Mika, Tousha Kiyoho and Takei Makoto. The musicians will perform a series of songs (hauta, minyo and risogaku) highlighted by traditional Japanese dances performed by three certified teachers with studios in the Southern California community: Bando Hidesomi, Bando Hiromiya and Nakamura Narumi. Through narratives, explanations, demonstrations, and on-stage interviews with the guest artists, patrons will learn about the shamisen, the most important of the traditional Japanese instruments, as well as the music that accompanies many Japanese performing arts. Honjoh is recognized by Japan’s Cultural Affairs Ministry as a master shamisen artist and composer, consultant and teacher. He has traveled throughout Japan and worldwide to promote the instrument, collaborating with international musicians in a variety of genres beyond the traditional Japanese framework. He often appears in minyo programs on NHK, Japan’s largest broadcasting organization, and is a consultant to NHK for traditional Japanese music of its drama series. His most recent appearance in Los Angeles was for the world tour of the Simon McBurney-directed drama “Shunkin.” Honjoh Hidetaro was commissioned to compose the music and perform it during each performance. Among the group of guest artists will be Honjoh’s first American student, Kevin Willoughby, who was born and raised in Torrance. Willoughby, whose professional name is Honjoh Hideeiji, studied piano and clarinet as a youth, then began nagauta (classical) shamisen studies and later, minyo (folk) in his teens in the South Bay community. He began studying shamisen in Tokyo under the tutelage of Honjoh Hidetaro each summer of his college years. After graduating from UCLA with a double major in ethnomusicology and Japanese, he moved to Tokyo to study at Toho Gakuen College of Drama and Music and now teaches English in Tokyo while continuing his shamisen studies and pursuing his passion. The theater is located at 3330 Civic Center Dr., near Torrance Boulevard and Madrona Avenue. Tickets are $25 to $40 and are available on the Torrance Cultural Arts Foundation website, torrancearts.org/shows. There is ample free parking. On Sunday, Sept. 30, there will be two hands-on shamisen workshops at the Gardena Valley Japanese Cultural Institute, 1964 W. 162nd St. in Gardena. For beginners, the workshop will be from 2 to 3:30 p.m. at a cost of $10, and shamisen will be provided. This will be followed by another 90-minute session for intermediate and advanced shamisen players. This workshop will be from 4 to 5:30 p.m. and will be $25 per participant. Intermediate/\advanced workshop registrants will be required to bring their own shamisen and bachi and also be able to read shamisen music scores. Registration is required for both workshops; go online to http://nihonbuyokai.org/upcoming-events. Seating in the beginners’ session is limited. Free parking is available. For further information, email [email protected] or visit the website.